This is an informal audio sample, assembled to demonstrate what an Amateur Radio net sounds like at a large Public Service event. 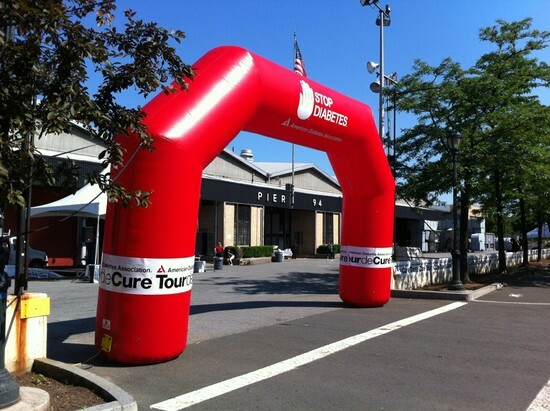 The event was the New York City Tour de Cure, for the American Diabetes Association on 3 June 2012. The event brought bicyclists from Manhattan, over the George Washington Bridge, into NY / NJ and up to Bear Mountain and back, a trip of some 100 miles. These communications took place along the Hudson River in both NY and NJ. Net Control was on Pier 94 in NYC. Some 15 operators participated and were either mobile with a driver, or stationary at pre-determined locations. There are three parts of the day's communications included below. They are separated by a tone. Net Control was N2NOV in the morning (this was a 12 hour event) but later others took over. This was a VHF repeater but the UHF side of the dual-band radio was on while this was recorded so you may hear other traffic. Helping out through public service events like this not only help the community, but it allows practice and interoperability between team members, so when real emergencies happen, they are better prepared.